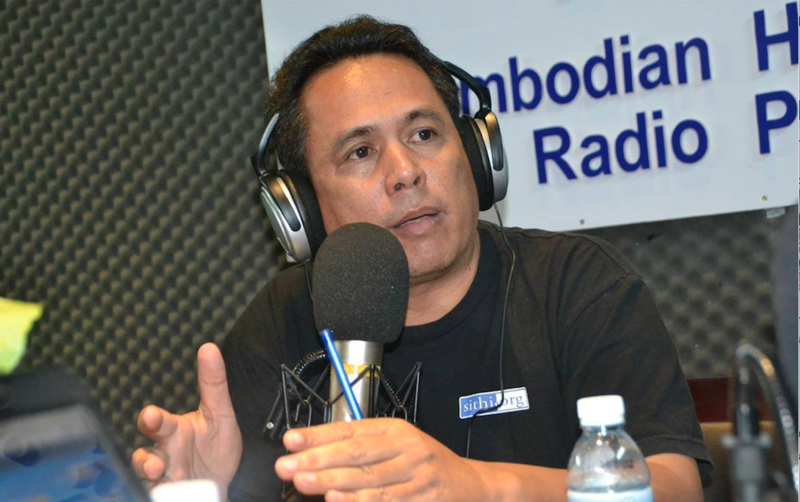 Photo courtesy of CCHR: Kem Ley at one of CCHR’s human rights radio talkshow. It was a very relaxing and fresh morning in Sihanoukville. I was driving down a road that ran alongside a peaceful beach with my husband. Suddenly, the phone rang, and I picked it up. It was my colleague, which worried me because I knew she would never call me on a Sunday, especially knowing I was on leave for my 5-year wedding anniversary. Her voice was terrified as she quickly said: Mr. Kem Ley was killed. She continued that he was killed at Starmart, near our office. I was not sure how to respond; I asked her if she was sure, holding on to the possibility that she could be wrong and the information she had was fake. I asked her to have our colleagues check the facts immediately. I then checked Facebook; whenever there is big news, you can be sure Cambodians will share and post about it on Facebook. My heart went numb as I saw all the posts about his killing – the scene where he was shot, and the crowd where people eagerly gathered to see what had happened. I was speechless. I felt like my heart was breaking into pieces. I could not believe what my colleague had told me, and what Facebook was now telling me, with the screen full of posts about Kem Ley — the man who used to serve as our board member, and who never turned his back on us if we needed his advice, even after leaving our board. In that moment of silence, many questions came to my mind. How would his wife and children, who I met and interacted with, handle the news? How would we, civil society advocates and the public, feel after his killing? This was a shocking moment for many of us who believed that Cambodia was moving away from politically-motivated killings and violence, and that our main concern now was legal and judicial harassment of human rights defenders. Between 2012 to 2014, Kem Ley was a board member at CCHR. After that, he moved on to continue his social work in the provinces, he often returned as a guest on our radio show. Nobody could speak to the hearts of the people quite like him. He was unique. Kem Ley is most commonly described as a political analyst. Though accurate, this description feels insufficient to capture the work he did, the people he engaged, the bravery he showed, and the message he sent to Cambodians everywhere. Kem Ley was unshaking in his commitment to the truth. He did not let fear or bias sway him, and criticized both the main parties at time, when he felt it was merited. In the days leading up to his death, it is said that Kem Ley knew his life was in danger, yet still he spoke out against the corruption and injustice that was continuing to impact the lives of ordinary Cambodians. Kem Ley made social and political issues something that everybody could be part of, a space in which no voice was devalued. He was a true democrat, and he believed that any political party – ruling or opposition – only had value and legitimacy if it listened to the ordinary people, connected with them, and amplified their voices. But Kem Ley had no desire to become a political leader. He wanted to learn as much as to teach, and he soon returned to his work with the communities in whose hands he saw the future of Cambodia. His final project – the ‘100 Nights Campaign’ – was an extensive exploration into the deep-rooted challenges faced by Cambodian society. He toured the country, staying with rural communities and hearing their stories of vulnerability, displacement and the destruction of their livelihoods as a result of economic land concessions granted to corporations. He only reached ‘Night 19’. Kem Ley also poured much of his time and energy into working with young people. In 2015, he founded the Young Analysts Group (YAG) – a group of students and young intellectuals who he trained in basic research, journalism and analytical skills. Through inspiring young people, Kem Ley hoped to reinvigorate the country’s social consciousness, and see the next generation lead the way in demanding good governance, equality and social justice. Though Kem Ley’s young mentees were shaken by his death, this has not stopped them. Even beyond the grave, Kem Ley continues to inspire. Aside from his legacy in the public sphere, Kem Ley also left behind a family. His wife, Bou Rachna, and five sons, one of whom was born four months after his death, fled Cambodia a month after his murder. After a difficult period living in Bangkok, they were finally granted asylum by the Australian authorities. Two years after Kem Ley’s murder, they are still waiting for true justice. On the second anniversary of his death, I remember Kem Ley, and the values he stood for. He was loved because he always told the truth, and in his memory, we long for the same. Rest in peace, rest in power. Civil society’s ability to act rests on the realization of three fundamental rights: the right to freedom of association, the right to peaceful assembly and the right to freedom of expression. A recent report from CIVICUS found that roughly 85% of the world’s population lives in countries where those rights faced serious challenges in the year 2016. The types of restriction on these fundamental rights vary greatly. Unfortunately Cambodia is not an exception to the global trend of shrinking civic spaces. On the contrary, it is one of the countries in south-east Asia that is experiencing a severe backlash against human rights. The right to state one’s opinion, to question government decisions, and to defend one’s rights without being threatened have never been fully realized in Cambodia, but over the last 18 months violations of international human rights law and the crackdown on civil society have reached extremely worrying levels. In 2016, a university student was sentenced to 18 months in prison because of a Facebook post on his page that called to start a “color revolution;” activists have been arbitrarily detained for months; opposition politicians are subject to legal harassment; and NGOs are threatened with being suspended or shut down due to allegedly violating “political neutrality.” Welcome to Cambodia, in the year 2017, where these are only a few examples of the shrinking civic spaces phenomenon percolating in the country. The International Center for Not-for-profit Law (“ICNL”) has assessed Cambodia’s legal environment as ‘not enabling’ for civil society, creating additional barriers with complicated registration requirements. Just like many other countries, Cambodia’s legislature has adopted new, restrictive laws, like the Law on Associations and NGOs (the “LANGO”), that violate the right to association and the ability of civil society to function without fear. Under the LANGO, NGOs and associations are required to be registered. Unregistered NGOs and associations are not allowed to carry out any activities in the country. This constitutes not only a restriction of freedom of association and expression, it also violates international best practices and standards which require that registration should be voluntary. Further, even if organizations are registered under the LANGO, they are still required to either inform or ask permission in advance from local authorities, if they are conducting activities in a province other than where they are registered. Their meetings are often monitored by local authorities and police officers, and there are growing reports of harassment, threats, and even arrests of activists on missions in the provinces. Another method to silence and immobilize civil society tends to be in the form of judicial harassment. Recent examples of judicial harassment include the arrest of Areng Valley activists objecting to the Areng hydroelectric dam project, and Mother Nature activists who were protesting sand dredging activities in Koh Kong. Probably the most prominent case of detained human rights defenders is the case of the FreeThe5KH detainees, five Cambodian human rights defenders and senior staff members of the Cambodian NGO Cambodian Human Rights and Development Association (“ADHOC”), who collectively worked on the case of a woman alleged to have had an extra-marital relationship with a deputy leader of the leading opposition party in Cambodia. All five were detained on charges of bribery of a witness and spent over a year in pre-trial detention, despite a lack of any credible evidence against them, before being released on 29 June 2017. The case of the FreeThe5KH received considerable international attention. In November 2016, the UN Working Group on Arbitrary Detention ruled their detention to be ‘arbitrary’ and urged the Royal Government of Cambodia (“RGC”) to immediately release the five. Social media plays an important role as an instrument used by the government to nip public protest against government actions in the bud. The government not only controls the majority of Khmer language media, it also monitors civil society actions online very closely, enabled by the repressive new Telecommunications Law. The law gives the government the power to monitor and prosecute virtual communication that threatens national security. The Cambodian Center for Human Rights (“CCHR”) conducted an analysis of the situation of internet freedom and digital rights in Cambodia after the Telecommunications Law came into force. The analysis includes case studies of seven people who have been arrested for their political comments online since August 2015. In addition, the study reveals that “at least 23 individuals have been publicly threatened since August 2015 on the basis of social media comments.” In the digital age, when social media has become one of the most important portals for political and public debates, these measures are used by state agencies as a tool to outlaw their critics. It has become life-threatening to be a civil society activist in Cambodia. At least seven land activists have been killed since 2010. 2016 saw violent attacks on and arrests of opposition leaders and civil society activists. Prominent political commentator Kem Ley was shot dead at a convenience store on 10 July 2017, which left Cambodian civil society in shock and fear. Oeuth Ang was convicted in March 2017 of premeditated murder and sentenced to life in prison. International and national civil society condemned the lack of transparency in the investigation of Dr. Kem Ley’s death, the sloppiness of the trial proceedings, and the failure to fully investigate the motive, potential accomplices and the circumstances of the shooting. In two separate civil society statements, organizations expressed serious concerns about the adequacy of the criminal process and whether all those involved have been identified and brought to justice. Another case was the attack on Am Sam Ath and Chan Puthisak at the World Habitat Day in March 2016. The monitoring manager of the Cambodian League for the Promotion and Defense of Human Rights (“LICADHO”) tried to peacefully resolve the violent attack of para-police officers on land activist Chan Puthisak and consequently got targeted himself for simply doing his job as a human rights monitor at an otherwise peaceful protest. The political climate in the run-up to the 2017 and 2018 elections that have been overshadowing all recent political developments for the past months, has been tense. However, it is these difficult times that illustrate the importance of the protection of civil and political rights of all citizens to ensure fair and free elections that reflect the will of the Cambodian people. There must be better communication across different organizations, sectors and countries. Civil society is highly fragmented in itself due to different organizational goals, approaches and beliefs which often prevent it from effectively working together. It needs to be understood though, that the shrinking civic spaces phenomenon will be the major challenge facing all civil society organisations in the future, no matter what their fundamental beliefs or goals. If there is no push back against harmful regulations that stop CSOs from working, there won’t be room for effective human rights work of any kind. The most important thing to do for all civil society organizations and society itself is to not stop fighting this threatening trend and to develop methods to regain and create new civic spaces. It is of crucial importance to the future of civil society to not give in, to adjust, learn and evolve together. In many restrictive environments CSOs self-censor and refrain from doing work that could potentially make them a target of the authorities. While this is an understandable and sometimes necessary form of self-preservation to protect staff, partners and beneficiaries, it is also a fast-track to the disappearance of civil society. Cambodia’s civil society has always been strident and has not allowed itself to be silenced. There is an urgent need for civil society to find new approaches and measures that will force the Cambodian authorities to loosen their grip around the neck of civil society actors and to turn its focus back to what really counts – the interests of the Cambodian people. This is the first in a series of blog posts on the theme of “Shrinking Civic Space in Cambodia.” The series will provide analysis and background information about how and why civil society space is being restricted all over the world, including in Cambodia. “Shrinking Civic Space in Cambodia – local manifestations of the global crackdown on civil society” is the introductory article to the blog series. Part One of the article gives an overview of the global phenomenon of shrinking civic spaces and international civil society, while Part Two offers an assessment of the legal environment and the national context of shrinking spaces for civil society in the Kingdom of Cambodia. Further articles will address various human rights topics that are of relevance in Cambodia’s current political climate and will illustrate how civil society is being threatened. Finally the series will suggest new ways forward on how to regain and create new civic space and to ensure the future of a free Cambodian civil society. We hope the blog will inform readers and encourage members of civil society to share their experiences and best practices on the prevention of shrinking civic spaces. We are always looking for individuals and writers to contribute to the Sithi Blog and/or to the “shrinking civic spaces” blog series. 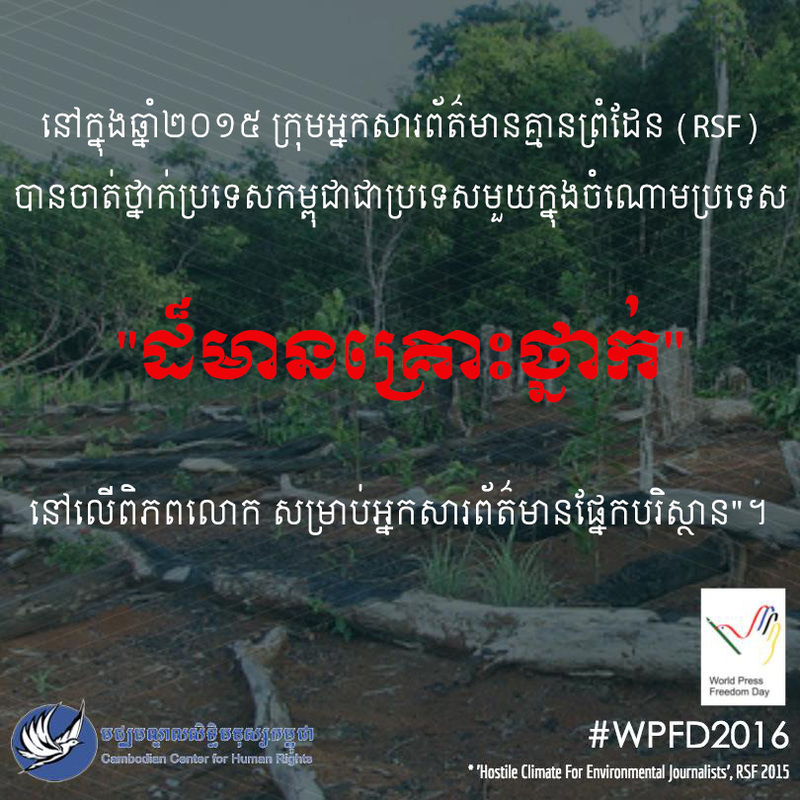 You can reach us via email at info@cchrcambodia.org. Recent crackdowns on civic space across the globe have been severe and continue to violate human rights, in particular the fundamental freedoms of the right to association, the right to peaceful assembly and the right to freedom of expression. In Honduras, at least 120 environmental activists have been murdered since 2010. In India, Greenpeace and other non-governmental organizations (“NGOs”) have been denied entry to continue their work. Amnesty reports have claimed there have been disappearances of activists in Egyptian prisons, others being tortured, and thousands of documented arrests during recent opposition protests in Russia. These shocking restrictions of fundamental freedoms increasingly fill up newspapers on a global scale. The space for civil society actors (“CSAs”) who raise their voices against governments, stand up for democratic values and human rights, and protest openly against social injustice, discrimination, land grabbing, environmental degradation in the name of big business and other human rights violations is shrinking drastically all over the world. Regardless of the nature of the political system or regime, governments in various countries are tightening the grip around the neck of civil society organizations (“CSOs”) and the space for civil society actions. Over the past two years, more than 60 countries have passed or drafted laws that limit the activities of non-governmental and civil society organizations. 96 countries have taken steps to inhibit NGOs from operating at full capacity. Taking measures to control civil society actors is an old, familiar game played by governments that has been anxiously noted and monitored for decades. Shockingly, there now seems to be an increase in the severity and openness with which authorities are attempting to limit people’s rights. 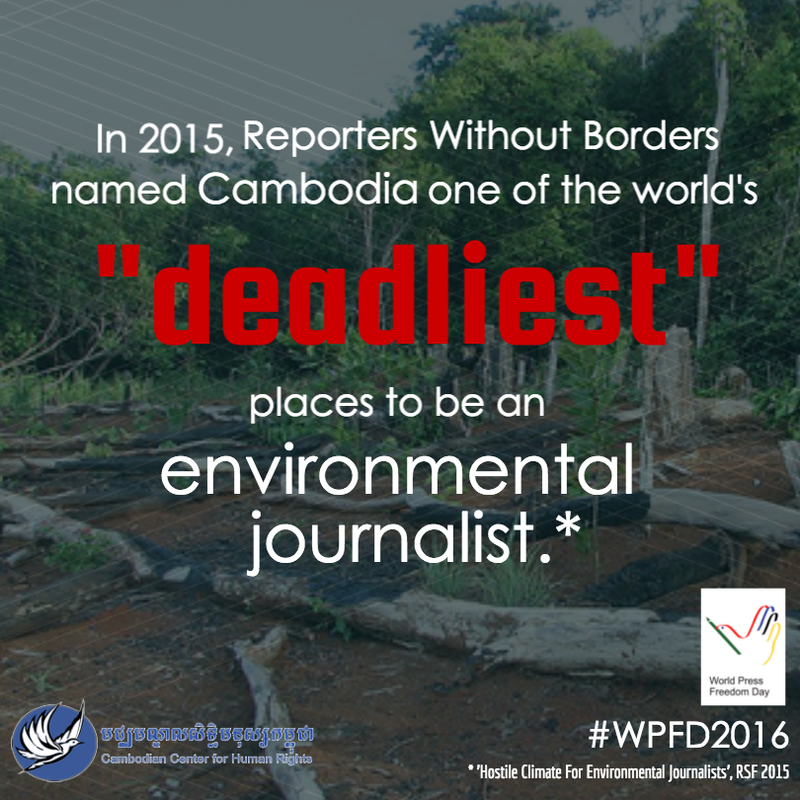 2015 was the deadliest year for environmental activists ever recorded and the trend did not regress in 2016. During this time, Forum-Asia documented 324 violations and abuses against human rights defenders (“HRDs”) in the region and hundreds of human rights activists received threats from government agencies, non-state actors or other individuals. But what does ”civil society” actually mean and why is it so important for individual states and the international community as a whole to have an active and vital civil society? “Civil Society” is a term that is often carelessly thrown around by the media, government authorities and even civil society itself. To properly discuss civil society, its role in global and national politics and also the shrinking civic space phenomenon, it is necessary to take a closer look at the term “civil society.” Academically speaking, it has proven difficult to develop a standard definition of civil society that applies to all different settings. This is due to the complexity of civil society and the many intersections it has with the economy, the state and institutions like the family or the media. In order to adequately define the meaning of ‘civil society’, important unifying criteria which shed light on this complex term and the variety of forms taken by civil society need to be examined. CSOs are self-organized, independent from state power, and have a non-profit based motivation, for example, the protection of certain norms, values and rights of the people. Civil society is not an equivalent to the more general term ‘society.’ Indeed, a society includes institutions that exceed the definition of civil society. Civil society is also not coextensive with the non-profit sector, but the third sector and civil society may often overlap . It is often said that civil society does not include the economic market and its participants, although some institutions, like for example the media, while essentially based on economic rules, have significant civil society elements and therefore can not be clearly identified as one or the other. Regardless of differences in detailed definitions, politicians, academics and other experts agree that the work of civil society plays an incredibly important part in shaping the political agenda of the international community as well as the agenda of national governments. CSOs also play an important part in scrutinizing government policy. Civil society has the power to give the public, who may otherwise have been largely or completely excluded, an amplified voice at a global, national and regional level, playing a large role in protecting marginalized groups and individuals subject to discrimination. Without the courage and stamina of civil society organizations around the globe, the world would not be the same. For example, civil society played a significant role in the establishment of the international criminal justice system. CSOs have successfully promoted new environmental agreements, for example the recent Paris Climate Agreement, and have greatly strengthened women’s rights and LGBTIQ rights across the globe, as well as, to give another example, lobbied for important arms control and disarmament measures. Indeed, the increased global impact of civil society can be considered one of the most significant social developments of modern history. However, even though civil society could chalk up multiple victories – and perhaps even in reaction to the growing influence of civil society groups – in recent years there has been a change in perspective on NGOs that can be noted not only from governments but also from academics and in public opinion. Questions about the effectiveness and legitimacy of many organizations have been presented by governments, funders and also citizens. In particular, the question of western hegemony has recently dominated international debates. Critics observe that prevailing conceptions of poverty and development are often shaped by those who have never really experienced their challenges. The voices of those who worry that global civil society is dominated by the ideas and values of relatively rich countries of the global north, purveyed by powerful international NGOs, have become louder over recent years. Many CSOs reacted to those serious accusations by changing their approaches and structures to adopt more local and regional strategies, turning away from international, “top-down” approaches. Despite different views about the legitimacy of many international NGOs, it is unambiguous that the steady concentration of power in the hands of only state governments, that seemed to be inevitable not so long ago, has been replaced by a system of shared power and shared responsibilities between multiple sectors and actors. At least up until now. CIVICUS, an organization which supports and monitors the rights of civil society worldwide, found restrictions on the right to freedom of assembly, freedom of expression and freedom of association in 109 countries worldwide in 2016. The question that arises when looking at the current situation for civil society all over the world is: why now? What has changed that governments feel so threatened by civil society that they create such hostile environments? While approaches and methods vary from country to country, the reasons for state oppression remain broadly the same. First, governments have felt the power of civil society in recent years all around the world: the Arab spring, color revolutions in eastern Europe, and the rise of right wing grass roots groups. Many governments, especially in transitioning and rapidly developing countries, dread the loss of their political power and aim to maintain the status quo, hence they target civil society groups most when these two goals seem to be threatened. Civil society can give or take away legitimacy on policy decisions, which may result in fear from government institutions. Instead of seeing civil society as a valuable resource to provide governments with expertise and a bridge between the government and the people, governments and economic elites have started viewing civil society as a threat that needs to be controlled and even eliminated. Second, governments cite concerns about the interference of foreign interests in domestic affairs through civil society organizations. The keyword commonly used by governments to justify their restrictive measures is “sovereignty,” arguing that one state does not have the right to interfere with the internal affairs of another state. So once a national protest or a movement develops and starts to become forceful, it is often shut down and delegitimized by being accused of being corrupted by foreign interests, even when evidence to support such claims is scarce. Some laws regulating NGOs cut off the supply of money from international sources for civil society making the work of many NGOs nearly impossible, like for example in Russia or Israel. The third common reason for shrinking spaces is vigorous counter-terrorism policies. While fighting terrorism is a legitimate goal, the problem is that states continue to disrespect human rights in the name of security. Laws are over-inclusive, and, besides often being counter-productive in the fight against terrorism, are being misused to restrict civil society or unintentionally affect civil society’s space to act. In extreme cases, laws disguised as anti-terror measures may have the underlying purpose of silencing the political opposition and civil society by accusing them of terrorism. In many countries a lack of awareness of the rights of civil society and their democratic functions contributes to the problem. Criticism of governments and state authorities may be perceived as unpatriotic and a threat to the political order and national security by segments of local populations. This bias is exploited by repressive governments who wish to de-legitimize the work of civil society. As a result, CSOs may be exposed to intimidation and threats within their own communities. In highly polarized societies, this stigmatization can have the effect of prejudicing people with different political or personal views against HRDs. If civil society organizations are kept from holding government to account, and if NGOs and other CSOs cannot stand up for individuals and marginalized groups, many people will face major threats to their livelihoods and safety, while governments will increasingly be able to act unchecked by independent scrutiny. Part two of this article will show how Cambodian CSAs and citizens are struggling under the pressure of the shrinking civic spaces phenomenon and the particular restrictions they are facing. Helmut K. Anheier, ‘Civil society: measurement, evaluation, policy’ (2004). Dr. Aisha Ghaus-Pasha, ‘Role of civil society organisations in governance’, (December 2004).